We were prophesied to be a church marked by the communing presence of God-Father, Son and Holy Spirit and marked by love in action empowered by his grace and the filling and leading of the Holy Spirit. We were prophesied to be an Antioch church. I dream of a place where those who have a strong home will, instead of paying to send their own kids to our Christian Fellowship School, pay for kids who come from broken homes to come to CFS. We will send out a tithe of our people into ministry and mission outside the walls of this church. A story of Launching Pads. Dreaming is a bit vague and it's hard to describe the end of a dream. Like most journeys there will be days it is very clear, and other days it will seem distant and obstructed from our sight. But the quality of our journey is up to us. Are we living purposely? I want to speak to us this morning about a purposeful way - increasing our love. I Thessalonians 3:12 - "And may the Lord increase your love..."
Love creates a place of transformation and life. It creates healing that is physical and emotional. Life sharers - we know the life of God and we share it with each other and with anyone that will receive it. Love is a culture of honor - the humane over inhumane. Jesus was the God-man, the incarnation of Christ who is, who was, who will ever be shown us real humanity It is our fear brokenness, pain, woundedness from sin that fuels our behavior which is largely inhumane. We are inhumane to ourselves, to our families, to those around us and to our worlds unless LOVE breaks in. Love makes us human again. It returns us to who we were created to become. Our hearts are restless until we find our rest in Him (who is love). 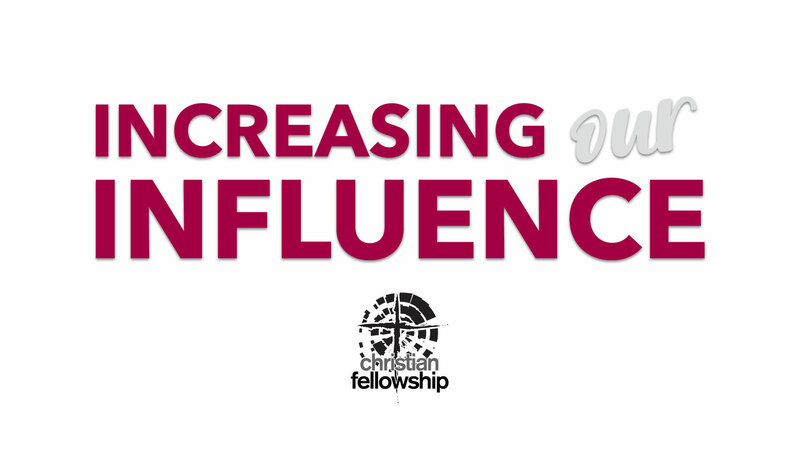 I want to challenge us as we Increase Our Influence for the sake of the Gospel of Jesus Christ; let's do it purposefully receiving the love of God, increasing the love between each other, overwhelming in love to the world all around us. In many ways, for me, love cannot be talked about if we do not also address fear. Not facing your fears would be like telling you to begin taking a bike ride with two flat tires. Fear and Love are not compatible. I John 4:16-19 - God is love; love never brings fear. We experience God's love for us - which was long before we loved HIM (John 4:10). We live fearlessly toward the day of judgment. As Jesus is now - crowned king of kings, lord of lords - risen son of God who has overcome death and the grave - So we are in this world. Love - it moves us to connection with others it believes, corrects, develops, and releases. Fear - it moves us to disconnection with others as it judges, controls, demands, and restricts. Love trusts and operates in the truth that I can only be responsible for me. Self-control to choose to love the other. This is a powerful life of choice. Fear mistrusts and operates in the lie that I can control other people's lives and punish them for not meeting my expectation. This is a powerless life of being the victim. Love responds. Love does not react. A response is about being responsible for your action. Responsibility is literally the "ability to respond." Love sees and moves and hopes. Love see people, creation, systems and the need of love inside each one of those. Love moves toward the need and levels the ground. Love gets in the ditch with the other. Love elevates up the other. Romans 14: 13, 15, 19, 21; Romans 15:1-7 - our goal is to empower others to what is right and good for spiritual maturity. Where is God calling you to step out into love? Christian Fellowship Church was live — with Donnie Berry at Christian Fellowship Church. Christian Fellowship Church was live — with Becky Jo Roberts at Christian Fellowship Church.